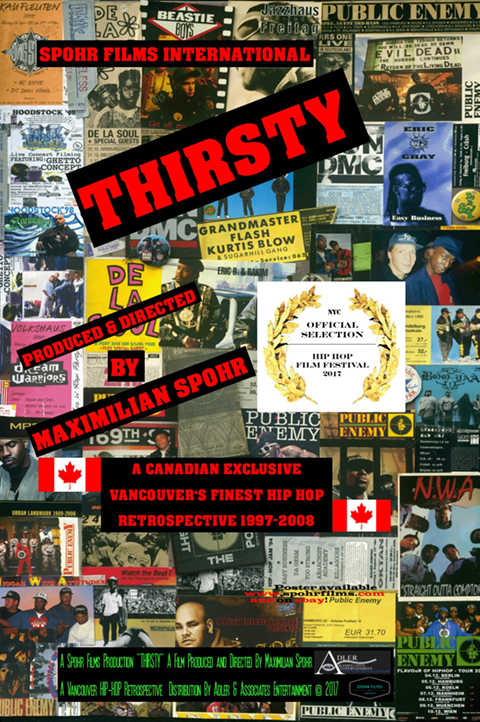 Thirsty: The Vancouver Hip-Hop Documentary – Adler & Associates Entertainment, Inc. Even though the Canadian music industry never supported hip-hop on a bigger scale except a very few exceptions. there are a lot of incredible talented artists. Artists like MC’s, DJ’s, beat producers, and songwriters. The film follows the vast history of underground hip-hop of the last 14 years in Vancouver, including concert footage, interviews, alley shots, graffiti cult and sprayers in Vancouver in pre-high rise downtown and pre-Olympic times. This film is a homage to Vancouver’s finest talent embedded into a picturesque graffiti journey of Vancouver.